From the Town Hall, through pubs, up to shopping centres – throughout October, teams from Paediatrics have been showcasing their work all over Oxford as part of the Ideas Festival. IF Oxford, the annual science and ideas festival, has given audiences all around the city the chance to take part in a range of science-oriented events. The activities prepared by staff from the Department of Paediatrics drew attention to the research conducted across multiple paediatric themes, and explained some fundamental biological concepts. For Paediatrics, the festival started on the 13th of October in the Oxford Town Hall. The Paediatric Neuroimaging stall attracted audiences interested in how the group researches pain in babies. Visitors could compare the sizes and weights of brains at various stages of development using 3D printed models; they had a go at matching baby emotions to facial expressions, and compared how baby and adult brains perceive pain. Children – and sometimes their parents – also enjoyed making paper brain hats. Read more about the work of the Paediatric Neuroimaging Group here. A team from across the Weatherall Institute of Molecular Medicine (including the Roberts Group) was in the Town Hall on the same night to engage the public on the topical issue of genome editing. 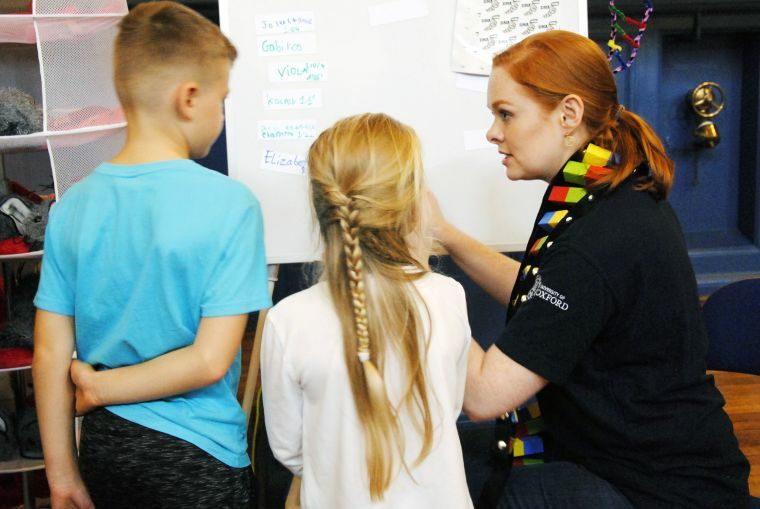 Visitors had a go at cutting and pasting giant DNA molecules, and learnt about the potential of this new technique. Younger visitors (and sometimes grown ups!) could compete against the clock to ‘edit’ sick cells in the bone marrow, an activity inspired by the research at our MRC Molecular Haematology Unit, while a more adult audience could learn about how genome editing allows researchers at the MRC Human Immunology Unit to study how cells can fight deadly viruses such as HIV and Zika. A week later, two Paediatrics groups made an appearance in the Templars Square shopping centre, joined by an overarching theme of our bodies’ immune system. The Oxford Vaccine Group explained the concept of herd immunity using a highly qualified team of Lego people, which proved very popular with children and adults alike. While children learned about antibody specificity through a throwing game where plush antibodies were aimed at our volunteer viruses, their parents had a go at the HIV quiz prepared by the Goulder Group. Our collection of giant microbes proved a hit across all ages, as everyone wanted to try to match them with their microscopy photographs, and learn how we study them at the Department of Paediatrics. On top of that, Joanna Bagniewska performed at the Science Oxford Cabaret – “A little bit of knowledge is a dangerous thing”, and talked about the strange personal lives of… octopuses. Understanding RSV, a major cause of respiratory illness in infants.